MeterTo mainly offers instruments and tools. otherwise we can't ensure the quality and after-sale service. 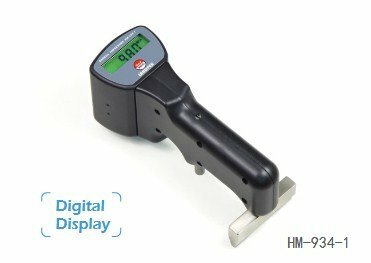 It is characterized in that provided with a balance positioning, a digital display of hardness value, and a non disassembly calibration and adjusting. It is with good stability, convenient calibration, and high accuracy of detection. Small in size, portable. Single hand operation, easy to use. Wide test range, can test from very soft pure aluminum to a particularly hard aluminum alloy. effective test range equivalent to the Brinell Hardness of 25~150HB. Can be used for measuring Barcol Hardness, other hardness value can be calculated out by the experimental curve. Such as Brinell Hardness (HB), Vickers Hardness (HV), Webster Hardness (HW), Rockwell Hardness (HRB/HRE/HRF/HRH). With the maximum hold function, hold the maximum hardness value during measurement. aluminum section bar, aluminum bar, aluminum casting, aluminum forging and aluminum alloy products. Can also be used in glass steel industry. The lead time is about 2 business days, Fedex/DHL/UPS Shipping to USA is 4-7 days. If you have any questions about this product by Landtek, contact us by completing and submitting the form below. If you are looking for a specif part number, please include it with your message.